Like many other small business owners, home inspectors often wear many hats: salesman, scheduler, complaint manager, counselor, adviser, writer, technician, and much more. While the responsibilities of the home inspector are many, there is one common thread that is central to performing each of these roles successfully—good communication. Many articles (and a quite a few books) have been written on how inspectors can market themselves, grow their businesses, or understand the many technical issues and systems within a home. 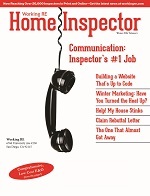 Less often discussed is what many industry veterans consider to be the home inspector’s number one job: communicating. • Answering the phone and getting the order—closing the inspection. 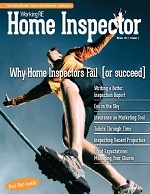 • Setting the client’s expectations regarding what a home inspection covers (and does not cover). • Communicating the results of your inspection in the report. • Verbally communicating with customers (and agents) during the inspection and after about defects and problems. This short list does not include many pre-sale processes, such as having a well-designed website and effective marketing materials, cultivating relationships within the community, and finding referral mavens. Nor does it mention the many post-inspection tasks, such as staying in touch with past customers and sending thank you notes to referring agents. However, in each case, your ability to communicate, from what you say about yourself in your marketing materials, how you answer the phone, sell your services, set expectations and write the inspection report, is one of the most important factors for the success of your business. To make a sports analogy, effective communication is both offense and defense for your business. It is not only critical to the growth of your business but it also accomplishes another important objective: it helps limit your liability and the likelihood of a claim. The first step is selling your services. Josh Fulfer, owner at KVF Marketing, a firm that helps home inspectors market their businesses, says that he was recently at a home inspector meeting in his state giving a presentation, when he decided to do a quick test; he called 15 inspectors to see how many would answer their phone. “I called during regular business hours and midweek. The results: only five businesses answered their phone. That’s only one out of three! That’s pretty bad!,” says Fulfer. Communicating with your client begins with answering the phone. “If you don’t answer when people are calling to give you their money, then you’re losing a lot of money. So if you want to earn more this year, start by simply answering your phone. Your competitors aren’t answering it, so take advantage of that,” advises Fulfer. No one knows better than home inspectors that it can be a challenge to answer the phone when you’re on the job. “If you are with a client or in the middle of an inspection, sometimes it’s just not possible to answer the phone. Some inspectors take a moment to text the person right away to let them know they will call once they are finished with the inspection, rather than taking the call. Sure that takes a moment to do but from what they have told me, it doesn’t really interrupt their inspection and the customers are fine with it,” says Fulfer. Another approach is to use an answering service or call center to take your missed calls. “There are different models available. Some charge by the minute while others are a flat rate. But for a few hundred dollars each month, you can use their services to ensure that you don’t miss any calls or business opportunities,” reports Fulfer. The importance of always answering your phone cannot be underestimated, according to Fulfer. This is because when a potential client calls, if they can’t reach a live person, they will move on down the list and call the next home inspector, which leads to lost business. “Many potential customers will hire the first person who answers the phone,” argues Fulfer. Of course communication is front and center when it comes to getting the business, but it becomes even more important before, during, and after the home inspection, especially if you hope to make your client happy while protecting your business and limiting your liability. The challenge begins well before the inspection when setting a client’s expectations. “The temptation to oversell what you do and what they should expect from you and your inspection may be great but … that may lead to dissatisfaction if you do not meet the expectations YOU set. 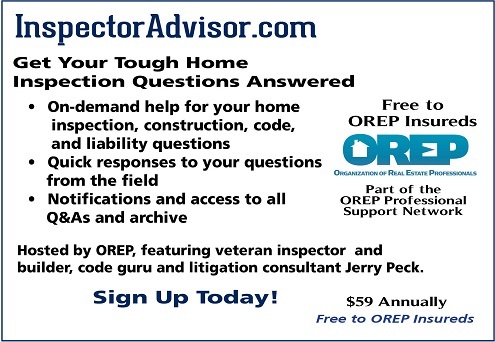 A seasoned inspector learns to balance how to deliver more, while not promising more than they can deliver,” says Jerry Peck, a home inspector veteran, litigation consultant and host of InspectorAdvisor.com, an online service that provides on-demand inspection support (free to OREP insureds). Christopher Chirafisi, a veteran inspector and the Product & Technical Training Manager at American Home Inspectors Training (AHIT), one of the largest home inspection training schools nationwide, explains that the written home inspection report is a double-edged sword. “Report writing is an essential part of risk management for inspectors but is equally important in helping your client understand the condition of the home they are buying. Don’t just tell the client what you saw, but what it means,” said Chirafisi. “Keep things in perspective and ask yourself: is the item/component you are inspecting serving its intended purpose, is it a safety/health/fire issue, or could it be a liability issue/great expense to the client? Explaining items in the report becomes especially important when dealing with potential issues in a home. “Let’s say that an issue is found in the electrical panel (non-manufacturer approved circuit breakers installed, double tapping on the main). It is critical to show and explain it in the report as well as to make the appropriate recommendations to your client, such as further evaluation, repair or monitoring. Will they understand what you are explaining? Maybe not, but it is your job as an inspector to educate your client. Don’t use technical jargon to sound smart; explain your findings in layman’s terms so the client won’t misinterpret or misunderstand what you are explaining,” advises Chirafisi. To balance the need to communicate effectively with the desire to be efficient when writing reports, Chirafisi recommends including pictures and having pre-written statements and recommendations that you can deploy as needed. “Always document what you see and take pictures. With the example of the electrical panel above, I will document the double tapping on the main and the non-approved breakers, and then for liability reasons I will usually use a disclaimer such as ‘recommend that a qualified electrical contractor evaluate and repair or replace any unsafe conditions or safety hazards in the electrical service panel,’ or something along those lines,” says Chirafisi. Oftentimes the main reason a home inspector can wind up with an angry client, or worse, a lawsuit, is because of a failure to effectively communicate both verbally and in writing. 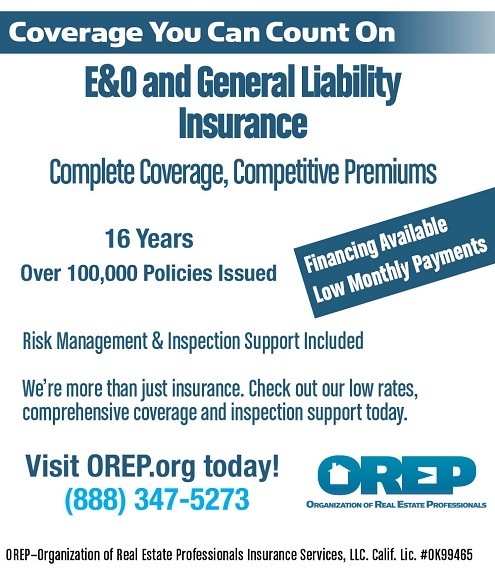 David Brauner, Senior Broker at OREP Insurance (OREP.org), a leading provider of home inspector E&O and GL insurance for over 16 years, reports that good communication is one of the most important factors for limiting an inspector’s liability. “In addition to a thorough inspection and a solid report, you need to set accurate expectations about your services in your Scope of Work, Standards of Practice, and in your contract,” says Brauner. “You also have to have the discipline to not undo all that great preparation in those written documents with random remarks made during the inspection that can undercut or contradict the protections set out in your agreement or the findings that will be in you report,” Brauner says. Echoing attorney Denneler’s comments regarding verbal comments, Brauner recommends always putting your observations in writing. “Take ample pictures to document everything and limit stray comments during the inspection. People mishear things and sometimes we misspeak—so it’s better to reserve your comments for the report. Let your report do the talking,” Brauner says. The same goes for when a problem arises after the inspection. “It’s equally important to be careful about what you say to a client who is in the beginning stages of the complaint process. If the complaint seems credible, don’t try to handle it yourself—that can be a disaster. Let your insurance company help you if you have insurance, and if you don’t, it’s best to get a seasoned attorney in your corner right away,” says Brauner. Once the sale is made and the report is delivered, what’s left? An important final step for home inspectors is to follow up with their past clients and maintain relationships with their customers. One source of business that inspectors often neglect are referrals. Not from agents, but from previous home buying clients. Jack Huntress, CEO of HomeBinder, a digital 3-ring binder for the homeowner, says that there is growing awareness of the importance of this. “In the past, many inspectors wanted their clients to forget their names as they felt the sooner they forgot them, the sooner they could stop worrying about people calling with issues,” says Huntress. That’s changing as many inspectors realize the value of cultivating these relationships. Some inspectors send a monthly email with home tips to their clients; others use a six-month check-in. Others use the opportunity around maintenance reminders (“sweep your chimney,” “pump your septic tank”) as a chance to keep their name and brand in front of clients. “The key is to make the communication relevant and timely to the needs of the homeowner. Today’s generation of buyer really needs guidance as Millennials are probably the least informed on homeownership,” Huntress says. This creates an opportunity for the inspector to deliver value beyond the inspection. “In fact, we are working on an annual home inspection concept with many of our home inspector clients who recognize the value to their business and the need in the marketplace,” says Huntress. With many inspectors coming from technical, trade and construction- related backgrounds, it can be all too easy to overlook the importance of the key trait that will spell success or failure for a home inspection business—communication. From marketing, building relationships and making the initial sale, to setting expectations, writing the report and staying in touch with clients, communicating effectively is crucial to both growing one’s business and thriving as a home inspector. It is also vital for staying out of trouble and avoiding unhappy (and litigious) clients. Josh Fulfer is a member of the Wisconsin Association of Home Inspectors. His firm specializes in generating qualified leads for home inspectors from the Internet, including web design and search engine marketing. You can find him at KVFmarketing.com. 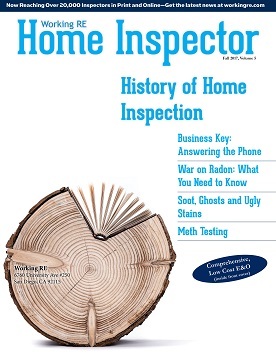 Note: The September 2017 issue of Working RE Inspector mailed to over 20,000 home inspectors nationwide. OREP Insureds enjoy guaranteed delivery of each print magazine and many more benefits.